We can discuss your requirements and either rent you a machine or put you in touch with one of local hire shop partners. 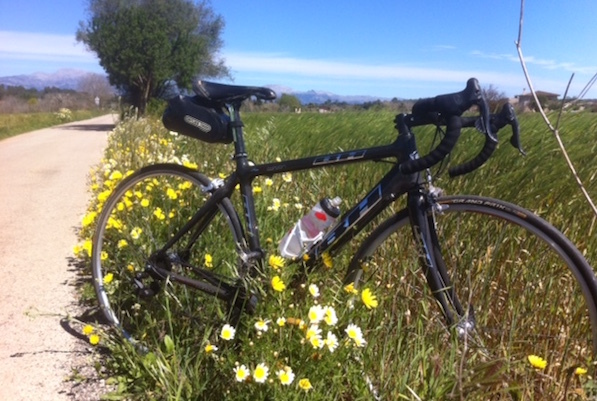 We currently are recommending Bikehead as our preferred partner, or Pro Cycle Hire if you’re staying further east (for example our Pollensa villa). We offer a few of our own bikes for hire. 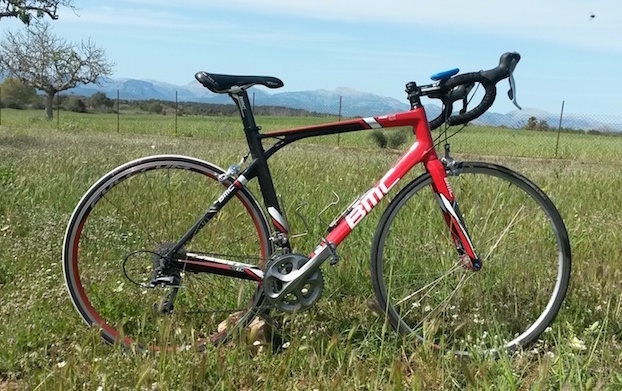 Sizes and options are limited, but if you are the right size and looking for a unique ride for your holiday, then Cycle Mallorca bikes will give you a beautiful week’s riding. Look especially for our high-handlebar options (see Brian Rourke and Contini bikes below); often we see husband and wife pairs riding together in Mallorca (what better holiday could there be? ), where he is riding the latest racing machine, while she is lumbered with a heavy ‘hybrid’-bike. Most likely, that hybrid was her only option given that she didn’t want the low handlebar position and narrow saddle of the race bike. Our ladies’ bikes allow a comfy position without being a slower bike than our other bikes. They have the high-end kit of a race bike: drop bars, but on a bike that is comfortable to ride. By using a shorter, taller stem to get a high handlebar height, all of the positions of the drop bars are in-reach: on the drops you’re not too low, and you can ride on the top of the bars or on the brake levers to give your arms and neck a change. We have a selection of several women-specific saddles for you to choose. 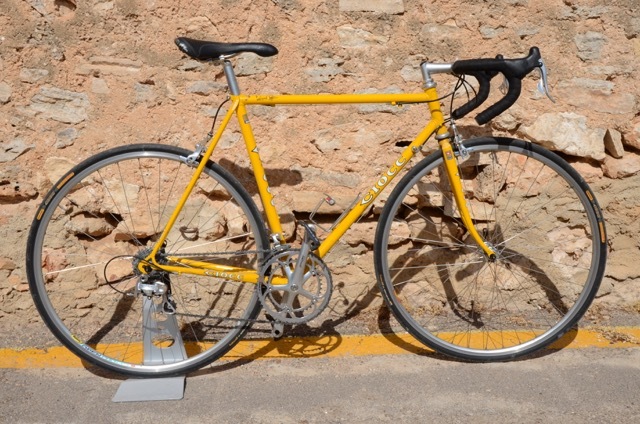 This is the SLC1 model, and was a race bike with the Bermuda national team until Cycle Mallorca acquired it. With full carbon frame, seat post, cranks and bars it’s super light and stiff. 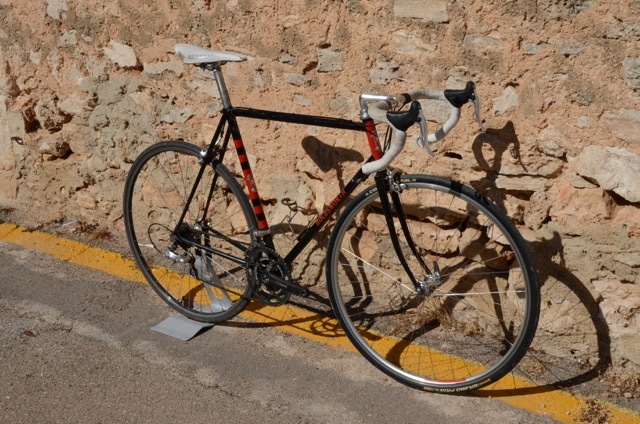 It has Campagnolo record/chorus 10-speed kit on (but with a SRAM red chainset). 12-25 or 12-28 cassette at the back, 53-39 at the front (we can swap in a 50-36 SRAM red compact if you prefer). It’s their 51cm model (which doesn’t really correspond to any actual length on the bike). The actual seat tube to the sloping top-tube is 49.5cm (c-c), and the actual sloping top tube is 53 cm. Measuring to an imaginary horizontal top-tube, gives a 54cm seat tube and 54cm top tube, so suits riders 5’6″ to 5’10”. 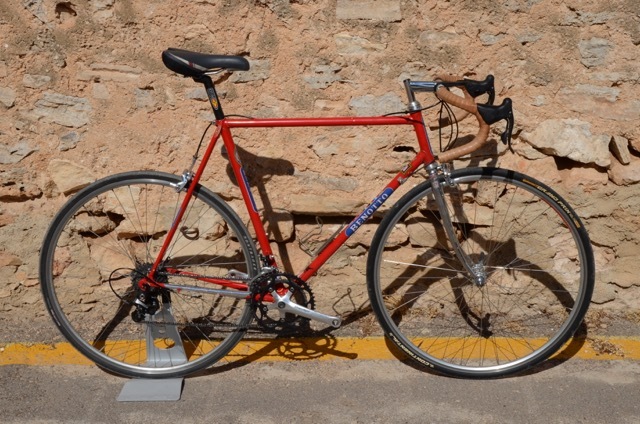 BH is perhaps the top Spanish bike make; like Orbea, these bikes are made in the Basque region. This machine has carbon frame, forks, seat post and cranks—it’s super light and stiff. 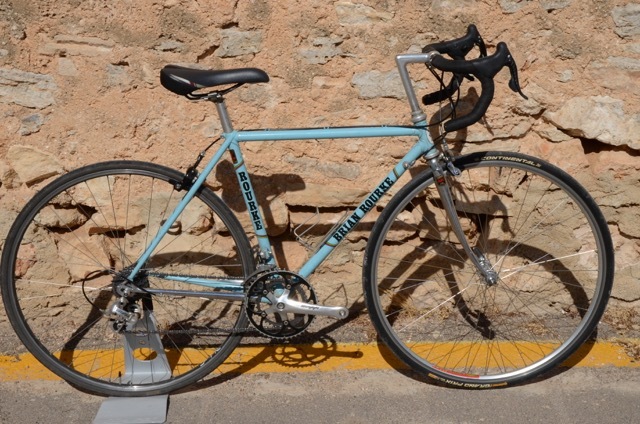 It has Campagnolo record/chorus 10-speed kit on (but with a SRAM Red chainset). 12-25 or 12-28 cassette at the back, 50-36 rings at the front. It’s a sloping top-tube bike, with actual seat tube of 42cm (c-c) and top tube of 52cm. Measuring to an imaginary horizontal top tube gives a seat tube of 53.5cm and top tube of 54cm, so suits riders 5’5″ to 5’8″. Ciocc is one of the great names in Italian hand-made bikes. “Ciocc” (which means poker-face) was the nickname of Giovanni Pelizzoli, who is the master frame-builder behind the marque. The brand still exists (selling carbon frames), but Pelizzoli still makes steel frames under his own name. 54cm seat tube (suits 5’6” to 5”9” rider). 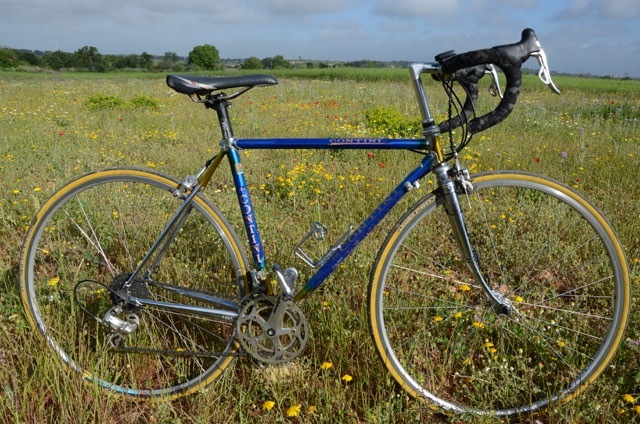 A classic Italian Columbus-tubed bike from the 80s—respaced and fitted with modern Campagnolo Centaur / Chorus 10-speed groupset. 12-28 cassette with 53-39 chainrings. “Benotto” is a name famous in the world of Italian hand-made bikes, made a little more famous perhaps because of the opening sequence of the film “A Sunday in Hell”, where the mechanic adjusts and cleans Francesco Moser’s Benotto. It is built up with modern Campagnolo Centaur / Chorus 10-speed groupset. 12-28 cassette with 50-34 chainrings 57cm seat tube with a 58cm top tube makes this suit a 5’11” to 6”2” rider. Holdsworth is one of the great names in British hand-made bikes. The brand still exists (at least the shop is still there in London), but they don’t make steel frames any longer. 56cm seat tube (suits 5’7” to 5”11” rider). A classic Reynolds 531-tubed bike from the 80s—respaced and fitted with modern Campagnolo Centaur / Chorus 10-speed groupset. 12-28 cassette with 50-34 chainrings. 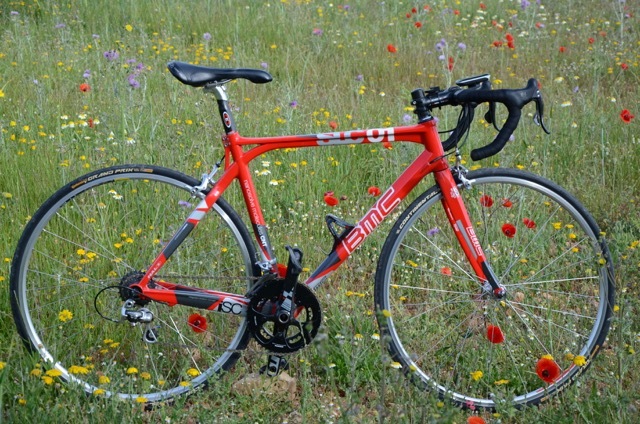 This BMC has Shimano Ultegra group, with 50-36 chainset and 12-28 ten-speed cassette. It’s their 57cm size (which is the length of the seat tube when measured to an imaginary horizontal top tube, c-c). The length of the actual seat tube to the sloping top tube is 50cm; and the actual top tube length is 55cm. The imaginary horizontal top tube length is 56cm , so this suits a 5’8” to 6”0” rider.